Following on from the webinar I gave in June on The Proper Role of Marketing in Overseas Campus Development (see Resources page of this site), here's a PDF copy of an article of mine (entitled: Branch Campus Development - Marketing expertise required) which has just been published in the Summer 2014 edition of the European Association for International Education's (EAIE) Forum magazine. International branch campuses can succeed or fail depending on whether they enrol enough students. Failure is costly - financially and for reputation. To give such a high-profile, high-risk development the best chance of success, marketing expertise must be sought and heeded throughout the project. 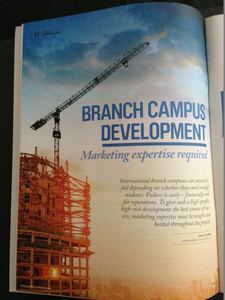 My article outlines where marketing fits in and how relevant marketing expertise can play a crucial role at the strategy development stage, the resource allocation stage and the implementation stage of a campus development project.